July’s full moon is known as the Full Thunder Moon. The name is thanks to the frequency of thunderstorms during this hot month, and I think it’s the perfect symbol of the transformation that can come through flashes of insight and a noisy, wild awakening. That’s what we’re going to celebrate in our Full Thunder Moon live cast, and you’re invited to join us on Monday, July 10 at 5:45 pm EST / 2:45pm PST / 10:45pm BST (British Summer Time). RSVP here! In preparation for the Full Thunder Moon, I’d love you to think about what kind of metaphorical thunder-and-lightning you’re ready for in your life. What area of your life is crying out for renewal or transformation? Think of a hot, humid summer day and the relief of a rainfall that cleanses the atmosphere and leaves the air cool and refreshed. Are you feeling the need to let loose and make some noise? If you’re holding together a lot of responsibilities, if your own emotional or spiritual needs are falling by the wayside, if you’re weighed down by the stresses of infertility, accept the Thunder Moon’s invitation to make some noise: joyful, angry, or a bit of both. Get out under the moonlight with a pair of cymbals (or pot lids!) and go crazy. I have a story to share with you on the Thunder Moon livecast about an amazing transformation I witnessed with one of my clients. Jessica became a completely different person in a matter of months–not quite a flash of lightning, but almost! 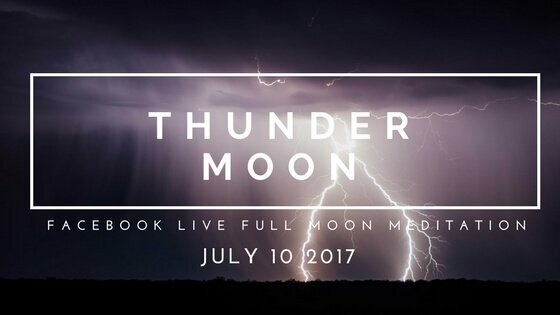 To hear about Jessica’s transformation and prepare to celebrate your own, tune in with me live on Facebook July 10th at 5:45 pm EST to meditate with the Thunder Moon. Click here to get details.